Founded in 1988 as an expansion team, Miami Heat competes in the Eastern Conference Southeast Division of the NBA. Owned by Micky Arison, the franchise has won three Championships, five Conference titles and twelve Division titles. The current head coach of the Miami Heat is Erik Spoelstra. For the 2017-18 season, Dwayne Wade returned from the Chicago Bulls to play with Miami once again. The Heat finished the regular season with a 44-38 record which qualified them for the playoffs. The Heat met head to head with the Philadelphia 76ers. Unfortunately the Heat lost the series 4-1. And now, the Heat is back and have their sights set high for this upcoming season. With hungry veterans leading the charge, Miami looks to reign atop of the Southeastern Conference and bring home another NBA championship. Division rivals, the Orlando Magic and the Atlanta Hawks will fight to keep the Heat down. Every playoff race is an exciting one down on South Beach. Grab your Miami Heat tickets and head down to the American Airlines Arena to help lead your team to a title. A Cavalier Effort - The Heat played against the Cavaliers at the American Airlines Arena in Miami on March 5, 2017, as part of the NBA regular season. The Cavaliers side was missing key players. LeBron James was out for rest and so was Kyrie Irving. Kevin Love was not playing the game either, due to an injury. The Heat was able to easily defeat the weakened Cavaliers side 120-92. But the next time the team met, James and Irving were well-rested and awaited the rematch eagerly. The Cavaliers wanted revenge, but didn’t quite get it. Miami stretched their lead to 20 in the early part of the fourth quarter and managed to hold off a furious comeback effort to win against the Cleveland side 106-98. The Lucky 13-game winning streak - After losing five of their six games on the road, the Heat returned home with the second- worst record in the league, 11-3. This winning streak was called one of the most impressive winning streaks by Dwayne Wade of the Chicago Bulls, almost as good as when the Big 3 won 27 games in a row during 2013. The longest winning streak in the NBA in the 2016-2017 season, and the third-longest in the history of Miami Heat, finally came to an end with a defeat against the 76ers at the Wells Fargo Center, with a 117-109 score. Even though it came to an abrupt end, it is still considered one of the finest moments in professional basketball. Miami Heat is part of major rivalries in the NBA. The main ones are the New York Knicks and the Chicago Bulls, among many others. Heat-Knicks Rivalry - This rivalry was, at one time, considered to be among the fiercest and most intense in the NBA. Sports Illustrated even called it the third best rivalry in the NBA. The first meeting of the two teams was on March 2, 1989. Since then, the team has met a total of 141 times, with the Knicks leading in all-time series records as well as regular season records. The postseason results, however, are tipped in the favor of Miami Heat with 15-14. 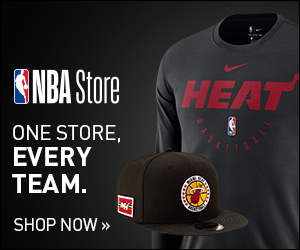 Bulls – Heat Rivalry - This rivalry started to heat up right around the time when the Miami side became contenders during the 1990s, a decade otherwise largely dominated by the Bulls. They were eliminated thrice by the Chicago Bulls, who eventually went on to win the title each of these three times. The rivalry was reignited in recent times as the Bulls, led by Derrick Rose, Joakim Noah and Luol Deng battled it out against the Big 3 from Miami Heat, LeBron James, Chris Bosh and Dwayne Wade. Fierce battles and hard fought games is what this rivalry is all about. With a total of 135 meetings so far, the Chicago Bulls lead in the all-time series and regular season records, though the Heat are not far behind either. The Miami Heat has had quite a few amazing players in its side over the years. Dwayne Wade is at the top of the list for the greatest players. He has been the most significant player in the history of Miami Heat since he joined in 2003. His 16,453 points are the highest in the franchise history, along with his 4,049 assists, 1,183 steals, 4,390 free throws and 5,861 field goals. LeBron James, who was with the team from 2010 - 2014, is without doubt one of the greatest players to put on a Miami Heat jersey. Even though he played only five seasons with the team, he already has five franchise records in triple-doubles (10), triple-doubles in a season (4), minutes played in a playoff game (50:17), steals in a playoff game (6) and field goals made in a playoff game (19). Tim Hardaway was one of the most iconic and potentially the greatest point guards in the history of Miami Heat. He holds four franchise records, including 806 three-point field goals and 19 assists in a single game. His No. 10 was retired by the Heat in 2009. With such a great team history and culture, fans of the Miami Heat cannot wait for the latest season to kick off. The home ground is all set to welcome thousands of fans. Located in the heart of downtown Miami, adjacent to South Beach, American Airlines Arena is one of the premier destinations in the NBA. Fans can enjoy, before and after contests, the vibrant entertainment and cultural districts surrounding the arena. Inside, The Heat have one of the most modern and sleek video/scoreboards in the league that changes colors depending on the atmosphere during games. Attending a Miami Heat game usually ends up being a great night out! Get your hands on these Miami Heat tickets 2018 and prepare to watch an action-filled season live. Future games include those against rivals Orlando Magic, Chicago Bulls, Boston Celtics and many others. Our process for purchasing cheap Miami Heat tickets is simple and fast. There are so many online ticketing sites, that it can be hard for customers to find the right place to buy Miami Heat tickets at the cheapest price. At ScoreBig we think of our customers first and foremost. We offer daily deals for Miami Heat events, so our customers can get the best seats for the best prices. ScoreBig will always go above and beyond to offer the cheapest Miami Heat tickets on the market. The Miami Heat schedule above, displays all available events for 2019 and 2020. Once you find the event that you would like to go to, click the red “Get Tickets” button. It is located on the right-hand side of the event listing, it will take you to an Miami Heat event ticket page. ScoreBig's event ticket page will display all available Miami Heat tickets for that event. On the event ticket page to help with your search for the right Miami Heat tickets, use the filters at the top to select quantity, price range, and more. There is also an interactive seating chart so you can pick where you want to sit. When you are ready to buy a ticket, click on the listing, and you will be directed to ScoreBig's checkout page. Upon completion of the information fields, your order will be processed and your Miami Heat tickets will be delivered via email, mail, or to your mobile device. What makes ScoreBig’s site stand out from the rest? We are constantly analyzing our competitors to improve our site, service, and prices. ScoreBig.com employees strive to offer the best process and experience to buy cheap Miami Heat tickets. Our goal is to get you the best seats to Miami Heat events. We offer daily discounts on our site and for special promotions check out our newsletter. If there are no Miami Heat events currently available, you can use our search feature at the top of the page to see a list of all popular events going on near you. No matter your price point, we have all the best deals and discounts on Miami Heat tickets. For more information on prices of Miami Heat tickets and the schedule for Miami Heat, check out our listings above. The last thing you want to find out is when the Miami Heat event you wanted to go to is sold-out. Don’t worry in many cases ScoreBig has affordable tickets to sold out events. We sell tickets from GA all the way to premium seating and parking. Skip the scalpers in the parking lot and get your tickets online from top Miami Heat ticket brokers. We get you in all events, buy your Miami Heat tickets here from a brand that many trust and rely on for all their ticketing needs. ScoreBig offers a 100% money-back guarantee. If you have been in search of cheap tickets for Miami Heat, ScoreBig by far is the best option. That’s why ScoreBig has more loyal customers than any other ticketing site. Shop at ScoreBig for safe and secure Miami Heat event tickets.